A lot of the time, a burrito is just a burrito. Fillings vary in quality and variety, but they are generally the same basic thing. Not so much at Burritos La Palma in El Monte. 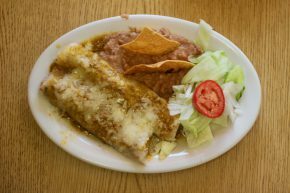 These burritos came straight from Jerez, Mexico and if you didn’t know any better you might think of them as enchiladas. Burritos La Palma specializes in birria and so that’s what I got.